Iraqi troops use a M1A1 Abrams tank during a March training session. The U.S. is bringing the tanks to Afghanistan. For more about the country and the war, read the Afghanistan Crossroads blog. Washington (CNN) -- The United States is beefing up its firepower in Afghanistan by employing heavily armored tanks in Afghanistan for the first time in the nine-year war, a military spokesman said Friday. The U.S. Marine Corps plans to use a company of M1A1 Abrams tanks in restive Helmand province by early spring, Marine Maj. Gabrielle Chapin said. The M1A1 tank is the fastest and most deadly ground combat weapons system available. It will allow for more aggressive missions while mitigating risks to U.S. forces, the military said. 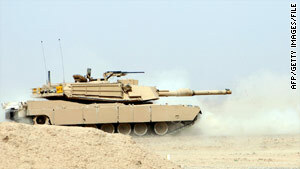 The tanks were used successfully by U.S. forces to battle insurgents in Iraq's Anbar province, Chapin said. "They bring superior optics, maneuverability and precision firepower that will enable us to isolate insurgent forces from key population centers and provide the ability to project power into insurgent safe havens," he said. Other coalition forces, including those from Canada, already have used tanks in Afghanistan. "Quite frankly, given the nature of the fight, they are very much needed," said Jeffrey Dressler, an analyst for the Institute for the Study of War. He said Gen. David Petraeus, who took over as the top American commander in Afghanistan in June, has taken a much more aggressive fight against the insurgency. The deployment of the tanks dovetails with that approach. They signal a more definitive presence for U.S. troops, said Col. John King, commander of the Georgia Army National Guard's 48th Infantry Brigade, who led an armored battalion in Iraq during the worst of that war in 2005 and 2006. "The M1 tank is a formidable machine," King said. "It's a formidable message. It signifies commitment, that we're committed." Each tank weighs 72 tons and can fire with precision from afar, mitigating risks for both U.S. forces and Afghan civilians. And, King said, the mere presence of the hulking tanks provides a psychological boost for the troops. "It's a tremendous combat multiplier," he said. "It's a big deal." He said that in Iraq, the mere sight of a tank made insurgents think twice about whether they wanted to fight. The company of 115 Marines in Helmand will have 15 tanks as they fight in an area that has been a hotbed of activity. The decision comes as Afghanistan tops the agenda at the NATO summit that started Friday in Lisbon, Portugal, and amid a dispute between Afghan President Hamid Karzai and NATO leaders over military strategy. CNN's Barbara Starr contributed to this report.